*Dieser Beitrag ist in freundlicher Zusammenarbeit mit Starck Paris entstanden. Most of us have heard oft he name Philippe Starck in the context of design. His concept of democratic design made him work for renowed houses like Alessi, Vitra and Kartell. After many years and fields of design, he’s now entering the world of fragrances with his brand Starck Paris. The creation of fragrances has always been something that lived in the back of Philippe’s mind. This idea resulted in a line of three perfumes: Peau de Soie, Peau de Pierre and Peau d’Ailleurs. Three fragrances in perfect harmony with his idea of what we are, what we have been and what we perhaps will be. I really like the story behind the new Starck fragrances. Peau de Soie is a paradox, a perfume whose femininity wraps around a man’s heart. A perfume that adheres and reveals the space between, between the surface and the core, where female mystery is evoked. Peau de Pierre is a masculine fragrance that reveals a man’s feminine side. It is the membrane, the symbol of that permanent ambiguity that filters our differences and personality. Peau d’Ailleurs is strange, undefinable and elusive. An exploration into ourselves, through the elsewhere and the unconscious, its perfume is also an escape into the infinite territory of dematerialization, where the scent of the cosmic void comes into contact with that of a Terra Incognita. My personal favorite is the feminine Peau de Soie in which ancient and modern raw materials and animal, woody and vegetable notes find a balance. 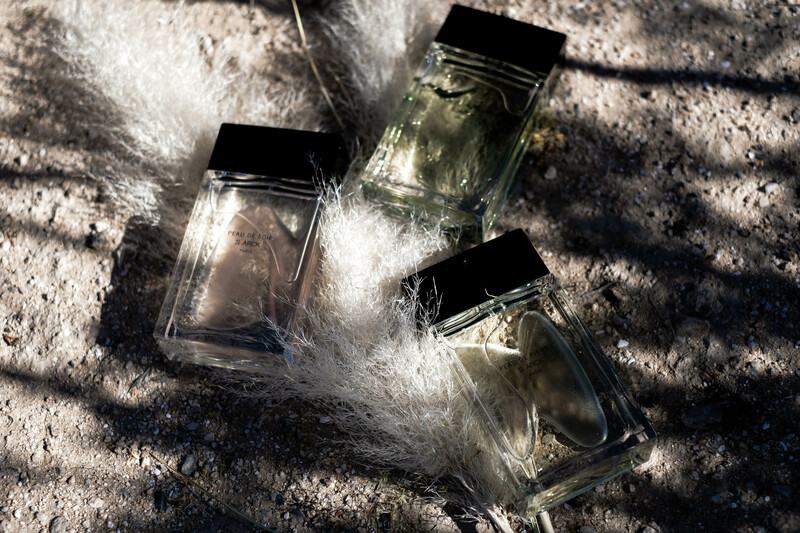 That’s why I shooted my new fav Starck parfum in Arizona at the Antelope Canyon. I guess it’s the perfect location surrounded by the beautiful rocks during sunset. I hope you like the pictures as much as I do and I’m excited to hear what you think about the Starck fragrances? Did you already know them? „Through skin we touch the mind, emotions and the should.“ – Starck Paris. „Starck Paris is a magical union between romantic ideal and a beautiful science.“ – Starck Paris.